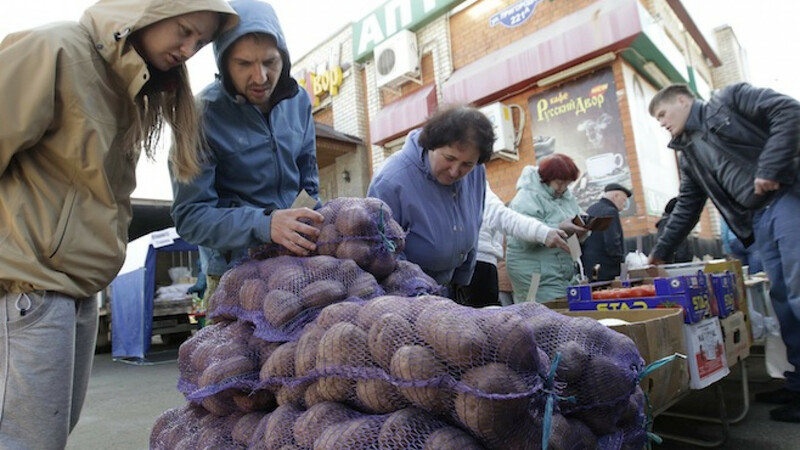 A vendor (R) sells vegetables at a food market in the Russian southern city of Stavropol. The World Bank predicted Wednesday that Russia's economy will contract by 3.8 percent this year and continue to underperform in the years to come amid the continuing impact of Western sanctions. Economic problems will also drive down real wages and push about 5 million more Russians into poverty this year, the World Bank said. 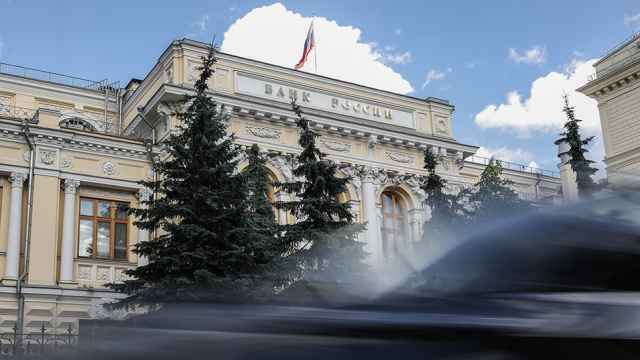 Russia faces an “era of small potential growth” because of low oil prices and meager investment, the World Bank's lead economist for Russia, Birgit Hansl, told reporters at the presentation of the biannual Russia Economic Report in Moscow. 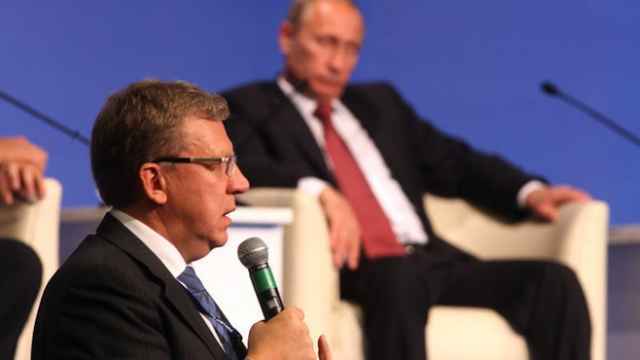 The World Bank’s baseline forecast, using an average oil price of $52 a barrel this year, said that Russia’s economy will shrink 3.8 percent in 2015 and 0.3 percent in 2016. Oil is Russia's chief export earner. The move is a significant downgrade from December when the international organization predicted just a 0.7 percent contraction for 2015. “The continued impact of sanctions and lower oil prices will push the Russian economy into a protracted recession,” the World Bank said in the report. Global benchmark Brent oil, which fell from highs of $115 in June, was trading at about $55 a barrel Wednesday. If oil prices average $45 a barrel this year then the Russian economy could shrink by up to 4.6 percent, the bank said. The European Union and the United States imposed a broad range of sanctions on Russia for Moscow’s role in the Ukraine crisis. The measures include asset freezes and travel bans for individuals, a block on state companies raising foreign debt, and restrictions on the sale of technology and equipment in some key sectors. 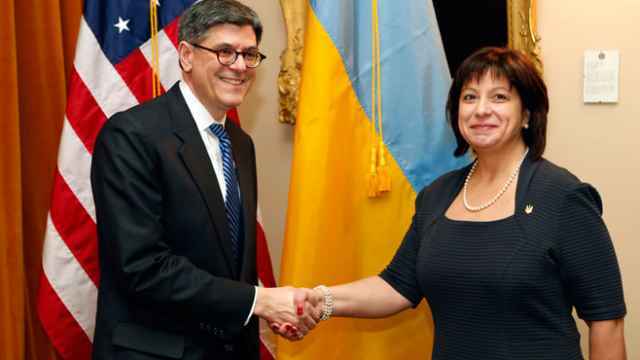 While tensions in Ukraine appear to be easing with a cease-fire in the east of the country, the World Bank said Wednesday that it now believes economic sanctions will be in place throughout 2015 and 2016. “The impact of sanctions is likely to linger for a long time. … Sanctions could well alter the structure of the Russian economy and the ways in which Russia integrates with the rest of the world,” the World Bank said, comparing Russia’s position with that of South Africa in the 1980s. The World Bank report highlighted that Russia’s economic woes will also have a significant impact on the most vulnerable sections of the country’s population. The number of Russian living in poverty — defined as those living on $5 or less a day — is set to record its first major rise since the late 1990s, according to the bank. Poverty rates fell steadily during a period of rising oil prices and stability in the 2000s and were flat in the 2008-09 financial crisis. But in 2015 the poverty rate will rise to 14.2 percent, meaning about 5 million people will have slipped into penury, according to the bank. In 2014, 11.2 percent of Russians were living below the poverty line, an increase of 600,000 people from 2013, according to the Federal Statistics Service. Pressure on the state budget from low oil prices gives the government fewer options to combat rising poverty. The well-known military theorist Carl von Clausewitz once said that "War is a mere continuation of politics by other means."